In project business, forecasting process provides visibility on whether a project is running within budget and provides insights on where are the deviations. 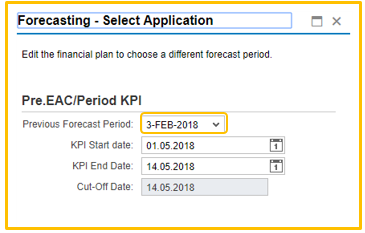 Typically, project forecasting is automated using a period-end process where actual postings until the end of period are considered to calculate forecast values. A project manager also performs the forecasting process at regular intervals (mostly as month end process but many times fortnightly and even weekly) if system generated forecast values need to be overridden. To perform forecasting within forecast period, In-Period forecasting is used and Period-End forecasting is performed during period end. 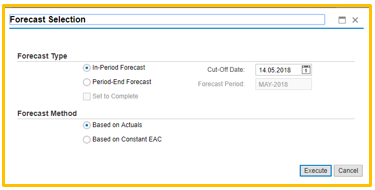 On forecast execution, system calculates Estimate at Complete (EAC), Estimate at Complete (ETC) based on the Plan cost, Actual cost and Completion of tasks/PoC (Percentage of completion). Output based planning/Forecasting: In this planning, Statistical Key Figures (SKF) are used to define output Quantity for a structure element and Input resource type and Resources are planned to achieve the planned output Qty. SKF’s are used to calculate the percentage of completion based on plan and actual postings. For example, to Paint a Wall of 20 Square meter, one can define an SKF and the required materials and labor as required resources to achieve this output quantity. Actuals can then be posted on SKF and resources to track the progress of quantities based on consumption of resources. For some resource types (for example: Labor, Equipment) productivity (Output Qty/ Input Qty) drives quantities. For Example: If a labor paints 10 M2 wall in 8 hrs, then productivity of the labor would 10 M2/8 Hr = 1.25M2/Hr. Similarly, one can also calculate other productivity related key figures (Productivity Factor, Earned Qty etc..). Within CPM 2.0 SP08, resource type configuration has been enhanced to configure such productivity relevant resource types. You can find more details about key figures by accessing the document link. In this blog, we will discuss about how a project manager can perform in-period output based forecasting in a flexible way using several industry standard key figures provided within CPM 2.0 SP08. Cut-Off date: With this enhancement, users are now able to conveniently specify a cut-off date for actual postings (such as cost, revenue, or quantity); project manager ability to view and forecast information on accurate data, for example, if relevant postings were made until last Friday, project managers can run a forecast based on cut-off date for in-period forecast. Additional Planning Key figures from Baseline version: For long running projects plan cost might change due to internal change request or customer change requests (for exampleà changing the type of paint, additional coat of the paint. Water resistance coating etc..), comparison of forecasting values with current plan cost and baseline version provides better visibility of margins, Now, project managers can find out variances of plan values (Output quantity, Input quantity and Plan cost) from base line version in addition to the current version. New planning functions are provided for project managers to copy system generated/previous forecast key figures to the current forecast key figures. Period KPI: For longer running projects, one would like to compare how project operation has been progressing within last one week or two weeks compared to the overall project . For example, one wants to see Percentage of Completion(PoC) in last 2 weeks or want to compare the productivity factor/ Productivity during the specific period with the overall productivity factor /productivity. You can define a period (duration maximum 31 days) for which you want to see various Non- Editable Key Figures (example: Output Quantity, Input Quantity, Cost, Productivity, Earned Quantity, PoC, etc..) you can find more details about Period key figures by accessing the document link. Adjustment at SKF level: As a project manager, one would want to adjust Output qty at an overall SKF level instead of individual structure elements. for example, Painting is required at each floor of the building. Painting of each floor is defined as separate structure elements and the same Painting SKF is assigned to all these Structure elements. Project managers can adjust aggregated Forecasting at SKF level, assume if a Project manager would like to increase the Overall ETC forecast cost by 10% for a specific SKF, once project manager increases the ETC cost by 10% at aggregated level for a SKF, system calculates the EAC for this SKF and this delta EAC cost is disaggregated to all associated structure elements (assigned to the same SKF) proportionately. Adjustment based on Productivity related key figures: Project manager wanted to keep the Overall effort for the painting effort should be 0.8hrs/1M2 for a structure element. Project manager can enter EAC Qty(input/Output) as 0.8, system calculates EAC Input Quantity (Hr.) and EAC Cost, EAC productivity and all relevant ETC key figures. During a forecast process, the project manager can add new cost line items. For example, equipment hours were not planned originally, but now need to be added to the forecast. When you add new cost line items during forecast, the system proportionately distributes the planned quantity into the remaining periods of the plan, based on the output quantity. As a result, ETC quantities are also updated. During the forecast process, project managers can enter comments at the level of a group (such as SKF, structure element or resource type). Project managers can also view the history of comments.